Specials: We shall be pleased to develop Non-Standard Brass fasteners as per specific requirements. Threads: ISO Metric, BSW, BA, BSF, UNC, UNF etc. 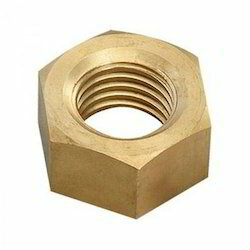 We are successfully meeting the varied requirements of our clients by providing the best quality range of Brass Hex Nut. Our range of hex nut bolts are fabricated in accordance with the AISI 316 Q (APL/SAI/SF) standards. In order to ensure quality, we use cutting edge technology and qualitative raw material. We are engaged in manufacturing and supplying wide gamut of square nuts. Owing to various attributes like dimensional accuracy, corrosion resistance and durability, these are extensively demanded by various clients.